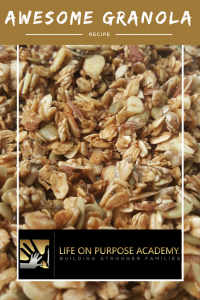 This yummy granola recipe is a crowd pleaser. I love it to top yogurt or ice cream. It's also yummy as a cereal. I hope you enjoy it as much as we do. Preheat oven to 350 degrees. Grease a cookie sheet with sides. Stir all ingredients well so there is no pool of liquid at the bottom of the bowl. Transfer to greased cookie sheet and bake 30-35 minutes. Stir the mixture every 10 minutes to ensure even baking and browning. Remove from oven when done and allow mixture to cool. You can add 1/3 Cup dried fruit when cool. Any dried fruit will do - cranberries, chopped dried apricots, raisins, chopped dried mangoes, etc. You can substitute maple syrup for honey. You can add cinnamon to the wet mixture if you like. I add 1/2 tsp. 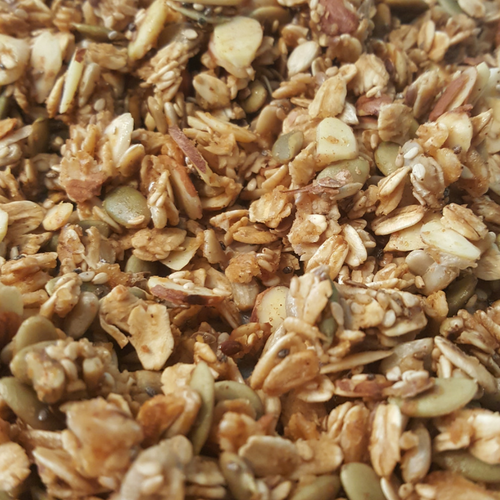 You can mix and match nuts and seeds. These are just my faves.